children while not knowing where her husband was buried. We cannot imagine the hardships of those days. And yet, Rosanna Coble reared children who went out into the world and did well. She was a godly woman who read the Bible. I believe it would have meant so much to her to know that a Union captain cared enough to send a letter to The Jackson Sun asking that someone go find Private James Coble’s remains. Capt. David Harts was on his deathbed when he wrote that letter in 1914. It was an act of Christian redemption and reconciliation in a time when it was clear war was starting in Europe. America would need to unite against this foe. a successful businessman. At one point, he was a hero, saving lives during a train wreck. And he was a godly man. I wish that we could talk with her today, have a conversation on the wooden porch, sitting in a rocking chair. I am grateful to my cousin, Don Hull, for sharing the photo of her that he had and a photo of her dress, which he has. But though I cannot talk with her, I am satisfied that my book, Monument to Healing: Two Soldiers and the Good Death, tells our family’s story and reminds us that as Christians, we must seek to live by the Bible, to offer forgiveness and redemption. Private James Coble, a Confederate soldier, died alone on a dark, cold night during a skirmish with Union troops. He fell beside a railroad trestle in South Madison County, near Jackson, Tennessee, on Dec. 19, 1862 during the Civil War. I wanted to share with you today two videos from interviews I did first with Col. Malcolm Wilcox and second in the wetlands field near a railroad trestle in South Madison County, Tennessee before my book came out June 30, 2015. The history of Salem Cemetery Battlefield is important as we understand the role the railroads played in the Civil War, and Gen. Forrest’s campaign to disrupt the Federal shipments of troops and supplies. My ancestor, Confederate Private James Coble, died before dawn on Dec. 19, 1862, as the Confederates attacked a Federal blockhouse not far from Salem Cemetery. He exemplifies what was called “The Good Death” in that time period when a soldier died with honor, as described by author Drew Gilpin Faust in his book, This Republic of Suffering: Death and the American Civil War. The second 9-minute video will be in an upcoming post. This painting by Gilbert Gaul is now in the Birmingham Museum of Art in Birmingham, Alabama. In this 1907 painting by Gilbert Gaul, a faithful horse stands over his fallen cavalryman master. This painting epitomizes the anguish of the Civil War, the lone soldier’s death. This photo appears in my book, Monument to Healing, with permission grnted by Elders Bookstore in Nashville. Vicksburg, Gibraltar of the West, was the grand prize of the Union’s early plans to control the Mississippi River. This would isolate the Confederate states of Arkansas, Louisiana, and Texas. Coupled with a blockade of Southern ports, this would insure a Union victory. The frightening effects of simultaneous attacks in December 1862 by Nathan Bedford Forrest in West Tennessee, Earl Van Dorn in Holly Springs, Mississippi, and John Hunt Morgan in Kentucky all involved attacks on rail facilities. The attacks caused U.S. Grant to rethink his plan for a second attack on Vicksburg initiated from Memphis. Attacks from multiple Confederate units made him acutely aware of potential danger to his troops and vital supply lines. As Grant’s invasion moved south, the ensuing battles delayed his plans for the siege of Vicksburg and proved costly in terms of men and supplies. President Abraham Lincoln understood the value of the railroads for shipping men and supplies. Under the Railways and Telegraph Act passed on January 3, 1862, all railway and telegraph companies’ officers and employees were subject to military authority. On February 11, 1862, the United States Military Railroads (U.S. M.R.R.) was established by the War Department. At first, authority was just over railroads serving the military, but on May 25, 1862, the act was changed to cover all railroads in the United States. However, the U.S. M.R.R. directed most of its attention to the railroads in hostile Southern territory. There is an extensive history of the railroad acts available for study in the Library of Congress Civil War Desk Reference book by Margaret E. Wagner, Gary W. Gallagher, and James M. McPherson. I’m grateful to the Department of History at the United States Military Academy at West Point for offering the map of the railroads for my book. 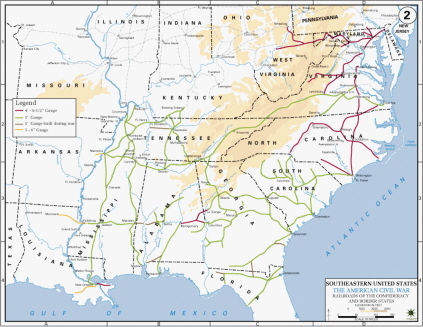 In 1962, the U.S. Military Academy at West Point produced a map of the main railroads of the Confederacy in 1861 in the book, “The West Point Atlas of the Civil War,” compiled by the Department of Military Art and Engineering, the United States Military Academy, chief editor, Vincent J. Esposito. My ancestor, Private James Coble, a Confederate soldier, died alone on a dark, cold night during a skirmish with Union troops. He fell beside a railroad trestle in South Madison County, near Jackson, Tenn., on Dec. 19, 1862 during the Civil War. With this military action long forgotten, in March 1914, a Union captain named David Harts Sr., formerly of the 106th Illinois Infantry, wrote a letter on his deathbed to The Jackson Sun expressing hope that someone in Jackson might search for the soldier’s body which had been given a hasty burial. The captain hoped to bring comfort to the soldier’s family and to assure them that the young husband and father had died the “Good Death,” an honorable death in war. The 106th Illinois Infantry’s first duty assignment was to protect the Mobile & Ohio Railroad, which traversed Tennessee between Columbus, Kentucky, and Corinth, Mississippi, running through Union City, Humboldt, and Jackson. President Abraham Lincoln well understood the importance of controlling the railroads. The United States Congress authorized Lincoln to seize control of the railroads and telegraph for military use in January 1862 and established the U.S. Military Railroad (USMRR) as a separate agency to operate any rail lines seized. Gen. Nathan Bedford Forrest posed a very real threat to Union-controlled railroads. Private Coble died helping Forrest in his successful “Christmas Raid” on Union supply lines. The Christmas Raid has passed into legend as an example of “lightning” warfare, based upon improvisation and willingness to take calculated risks. 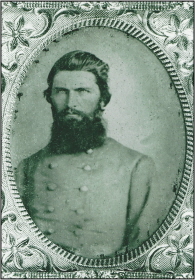 Since the soldier fought for Forrest’s partisan Southern cavalry, Harts’ action exemplifies Christian redemption and reconciliation between North and South. Not only was Private Coble’s body found and buried, a monument was erected in the field where his remains were located. In 2014, I had the monument moved to Salem Cemetery in Madison County. Now that the wetlands field is dry, I will move Private Coble’s remains from that lonely site to Salem Cemetery on the Civil War Trail where his sacrifice is honored. I have created a trust so that proceeds from “Monument to Healing,” will go to historic preservation. My research on the history surrounding his death went on for a long time, during which I developed an immense appreciation for sacrifices made by soldiers on both sides of the terrible conflict. 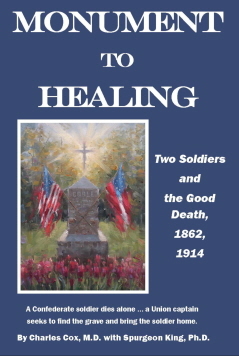 The result of this research is my book, “Monument to Healing: Two Soldiers and the Good Death, 1862 to 1914, published by The HillHelen Group in Jackson. As Dr. Spurgeon King, my co-author of my book,, has written, Captain Harts shaped the latter stages of the story through his quest for personal redemption.